There was nothing m-i-n-i-a-t-u-r-e about the effort that Fitzhugh Park Elementary student Camden Atkinson put into his school spelling bee. 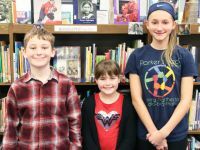 The sixth-grader won the FPS spelling bee with the word “miniature” and will join his peers Jude Johnson (fourth-grade) and Hannah Barbera (fifth-grade) at the Oswego City School District spelling bee in March. The trio earned first-, second- and third-place honors, respectively, after a total 29 finalists in grades four to six competed in the building-wide event. FPS’ spelling bee went 10 rounds. Each competitor was required to say the word, spell it and then repeat the word during their turn. If needed, students could ask for the definition, origin or for the word to be used in a sentence. Prior to the spelling bee, pronouncer and FPS library media specialist Serena Waldron encouraged all entrants to think before they spell, take their time and to be proud for how far they came from their in-class qualifying spelling test. Principal Donna Simmons commended each speller for their participation and wished them all luck. The event was supported by judges: second-grade teacher Cari Joyce, literacy specialist Jamie Brancato, instructional coach Cheryl Beck and literacy specialist Erin Wilder.